When you want something so delicious but without strong onion-garlic flavours, I dream up having this Niramish Paneer to pair with Poori ( deep fried Indian flatbread ) or hot roti. 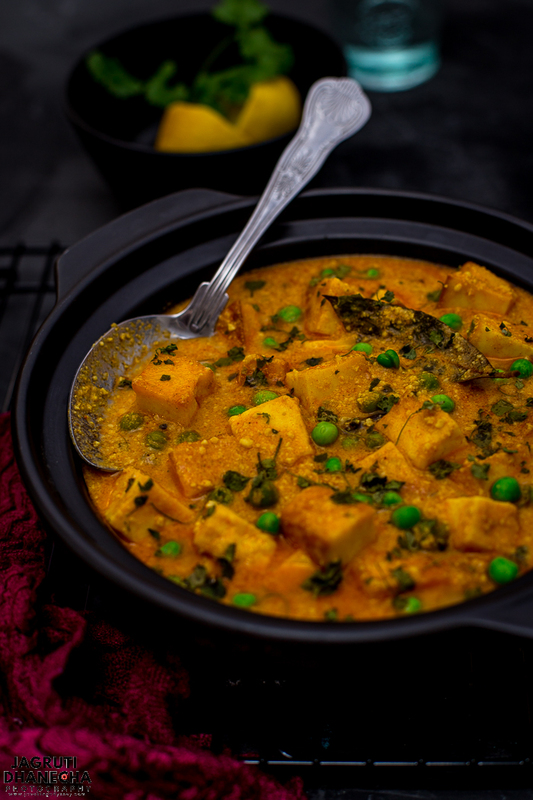 This easy to prepare and finger licking curry is perfect for a family lunch, dinner or party. When I saw a video of Niramish Dum Aloo on one of the social media platforms, I shared it with my daughter and within a few seconds I got her text saying "Ma, shall we cook this at home when I come for Diwali celebration" Lol actually I was hoping for a text like that as I wanted to cook that dish on a day when we perform prayers at home and only cook no onion garlic dishes. So that happened and we immensely enjoyed the curry with poori! But while we were cooking this curry (mostly Hayley my daughter cooked this recipe) we were talking about other options for it too, and she suggested that I should cook this curry with Paneer too. Perfect idea! I only knew that Niramish word belongs to the Bengali language, but until I searched on Google for its meaning, I had no clue. According to Google, the meaning of Niramish means without meat, fish or eggs. Basically, a recipe prepared with vegetables and milk products is called 'NIRAMISH'. 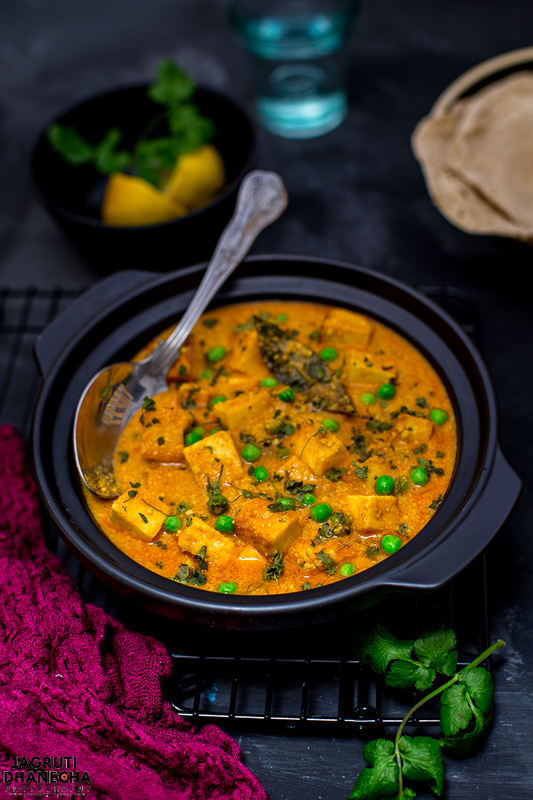 In this curry marinated paneer is gently simmered in a creamy and mildly spiced cashew gravy. Now one of our favourite, a curry that is just more than a side dish for your mains. 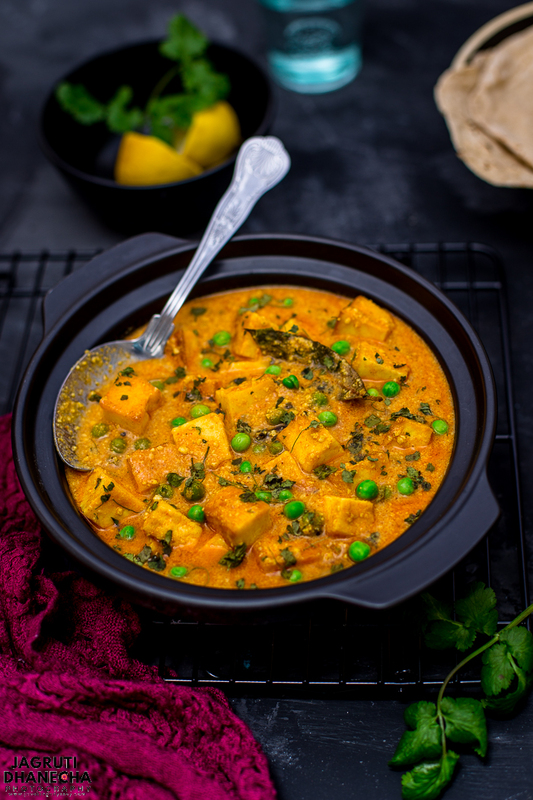 Paneer is a fresh, mild and milky Indian cheese that is unsalted, white in colour and prepared with cow or buffalo milk, thus it is not suitable for vegans. 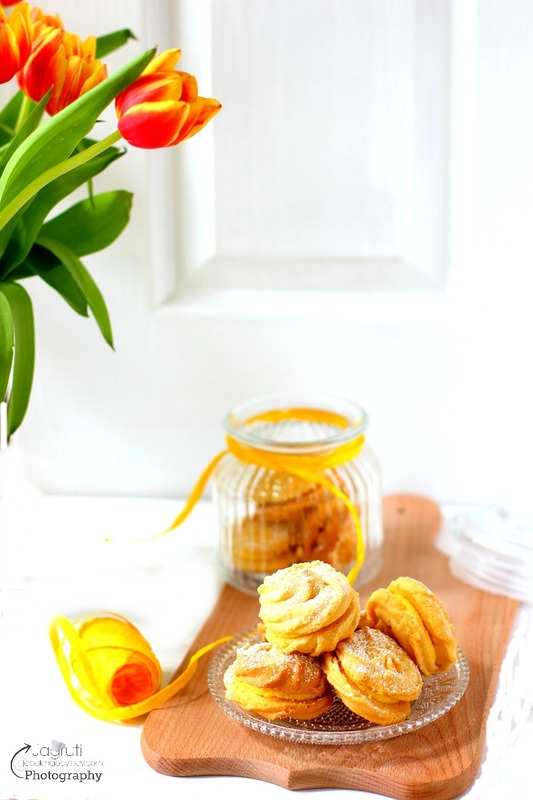 It doesn't require ageing or culturing and so easy to prepare at home under an hour. Paneer which works so well within aromatic-style Indian dishes. 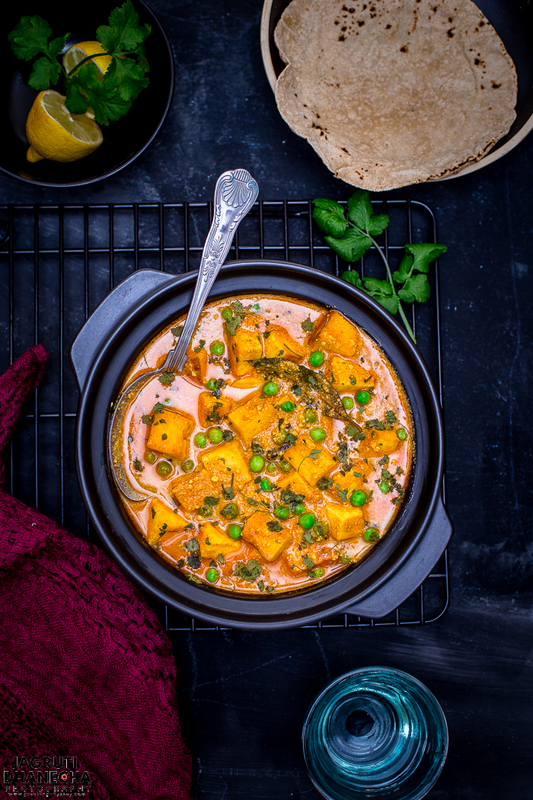 From vegetarian curries and stuffed flatbreads to spiced skewers, Paneer is versatile thus it is used in making drool-worthy Indian desserts too such as Mango Paneer Kheer. Along with paneer, cashew and white poppy seeds, we will need a few whole spices such as bay leaf, cinnamon, cloves and cardamom which lend delicious flavours to this curry. You don't miss onion and garlic at all! Also fresh spices and vegetables including ginger, green chillies, tomato and basic Indian spice powders. Green peas are optional here- if don't have at home then nothing to worry about. First, soak cashew and poppy seeds ( Khus Khus ) in warm water for 15-20 minutes. In a bowl place paneer, add salt, red chilli powder, pinch turmeric powder and little oil, mix and leave it to marinate for 10 minutes. In a grinder add soaked cashews, poppy seeds, and tomato and make a fine paste. Heat oil in a heavy bottom pan or kadai, and fry the marinated paneer pieces until they turn light brown. Remove it and leave it aside. In the same oil a teaspoon of sugar and mix well then add whole spices. Once they crackle add cashew puree, add crushed ginger and green chillies, lower the heat and fry the paste for good five minutes or until oil is leaving the pan edges. Add turmeric, red chilli and ground coriander and cumin. Mix everything and cook the mixture further 3-4 minutes. Add green peas if using ( I have used frozen ). Mix and add some water, let the mixture boil for a couple of minutes. Add fried paneer pieces and cook for 3-4 minutes. Add garam masala powder, fennel powder and kasuri methi. Let the curry cook another minute or so then turn off the heat. In a bowl place paneer, add salt, red chilli powder, pinch turmeric powder and 1TBSP oil, mix and leave it to marinate. In a grinder add soaked cashews, poppy seeds, and tomato and make a fine paste. Heat oil in a heavy bottom pan or kadai, and fry the marinated paneer pieces until they turn light brown. Remove it and leave it aside. In the same oil a teaspoon of sugar and mix well then add whole spices. Once they crackle add cashew puree, add crushed ginger and green chillies, lower the heat and fry the paste for good five minutes or until oil is leaving the pan edges. Add turmeric, red chilli and ground coriander and cumin. Mix everything and cook the mixture further 3-4 minutes. Add green peas if using ( I used frozen ). Mix and add some water, let the mixture boil for a couple of minutes. Add fried paneer pieces and cook for 3-4 minutes. Add garam masala powder, fennel powder and kasuri methi. Let the curry cook another minute or so then turn off the heat. Serve hot with poori, paratha or roti. If pressed for time soak cashew and poppy seeds in boiling water for 5 minutes. For richer flavours and taste you can use ghee instead of oil when you start cooking the curry.